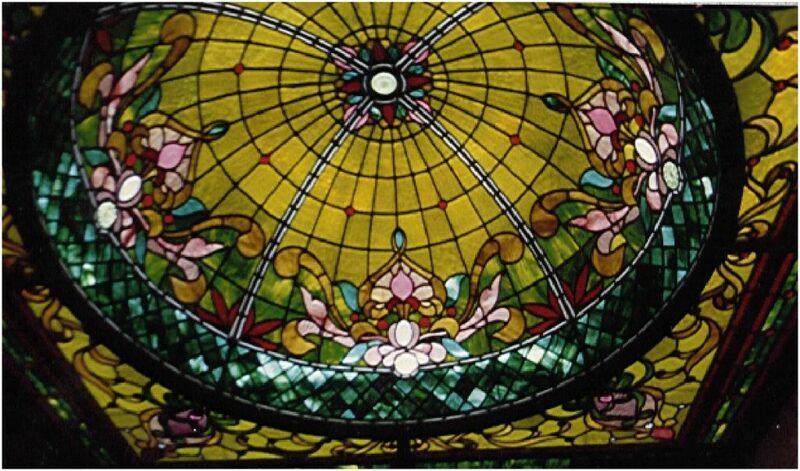 Dome Ceilings and Skylights are among the most memorable features of fine architectural spaces. There is possibly nothing more inspiring than a room with an illuminated ceiling. 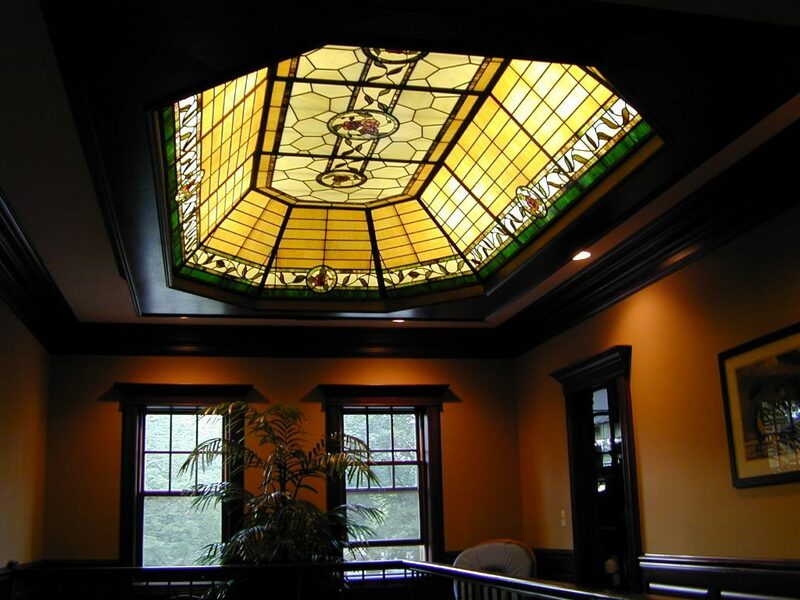 As an ornamental feature, or covering the entire expanse, the warm glow of stained glass overhead imparts a feeling of grandeur to any space. We work with you to determine your requirements and the best use of the available space. Flat or low ceilings can be framed to display a laylight system of flat panels. 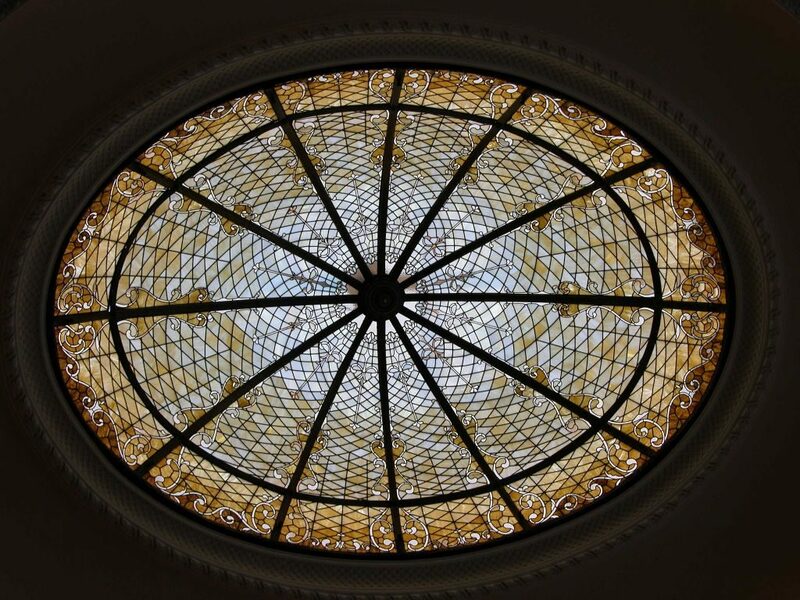 Larger domed skylights require structural framing that we produce in steel, brass, aluminum or wood. Lighting systems can be designed to provide supplemental lighting or controlled illumination for areas that have limited natural light. Contemporary light sources can be installed that are energy efficient. Use of LED lighting panels and grid systems provide the best option for energy savings, ease of maintenance, and for areas where cavity space is limited. 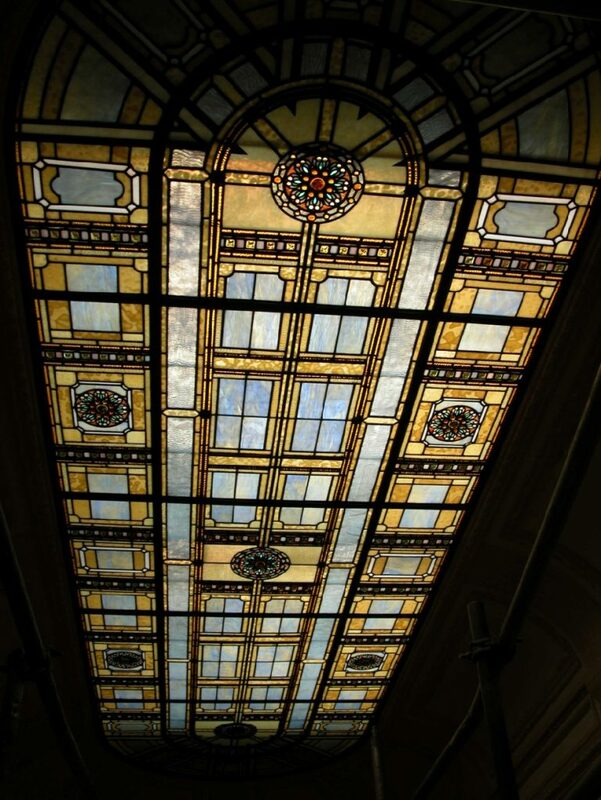 Atrium glass ceiling features thick iridescent hand cast jewels and rich opalescent rippled glasses. Constructed of leaded panels and a steel support frame. Size: 15′ x 5′ approx. 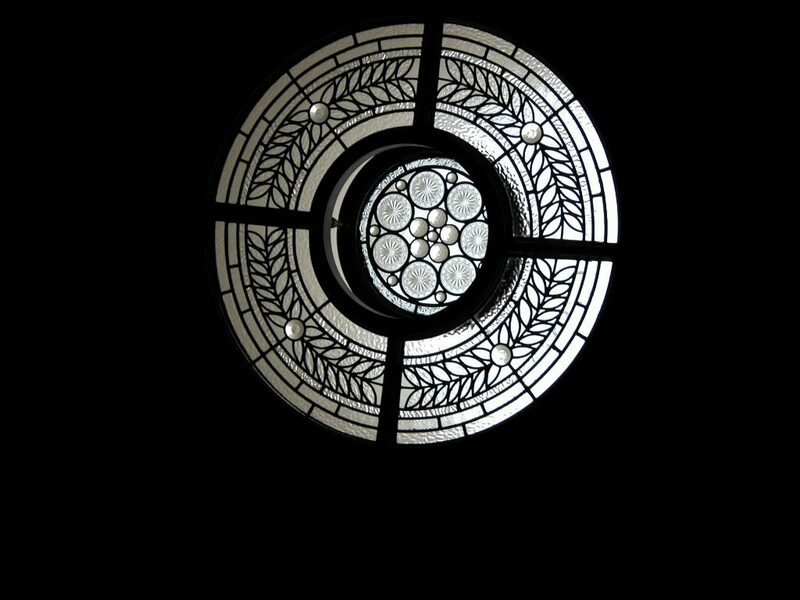 Dome ceiling fixture of illuminated stained glass at Chicago O’Hare Airport – United terminal C. – The Berghoff Cafe. The center lens is removeable for periodic maintenence, and relamping. Laminated stained glass panels and polished crystal mullions illuminate this elegant Art Deco room in a Chicago residence. 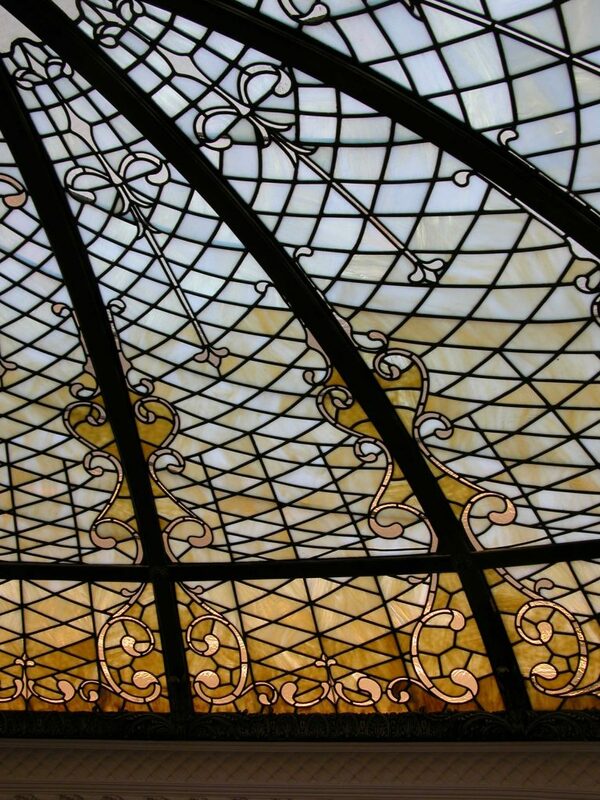 This gracefully curved stained glass canopy is a contemporary re-creation of the famed ceilingof the Hotel Solvay in Brussels, Belgium by Art Nouveau architect Victor Horta. 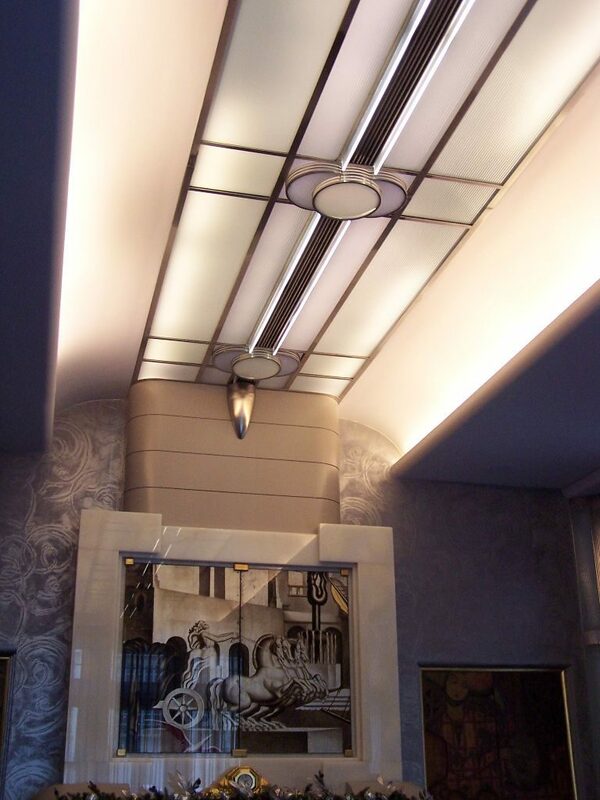 The illuminated ceiling features bronze rails and decorative scrolled brackets. Blown glass floral shades provide discrete lighting along an adjacent feature wall. This graceful elliptical dome features a rich patter of opalescent glasses, set into a framework of Ornamental Antique Brass with raised sculptural flourishes. Four of the twenty four panels in the corners are removable independently, allowing for periodic relamping. The center aperture of the dome is fitted with a motorized pulley that contols the chandelier suspended there. This decorative ceiling fixture comprises a complete hemisphere, set into a flat ceiling construction. 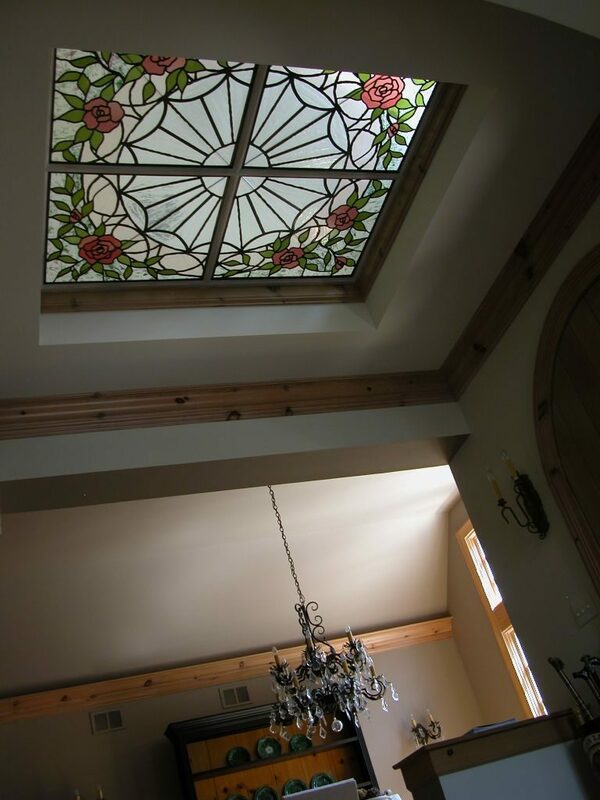 This unusual feature creates a wall-to-wall stained glass installation. The custom made steel framing integrates smoothly with the leading. The dome is five feet in diameter. 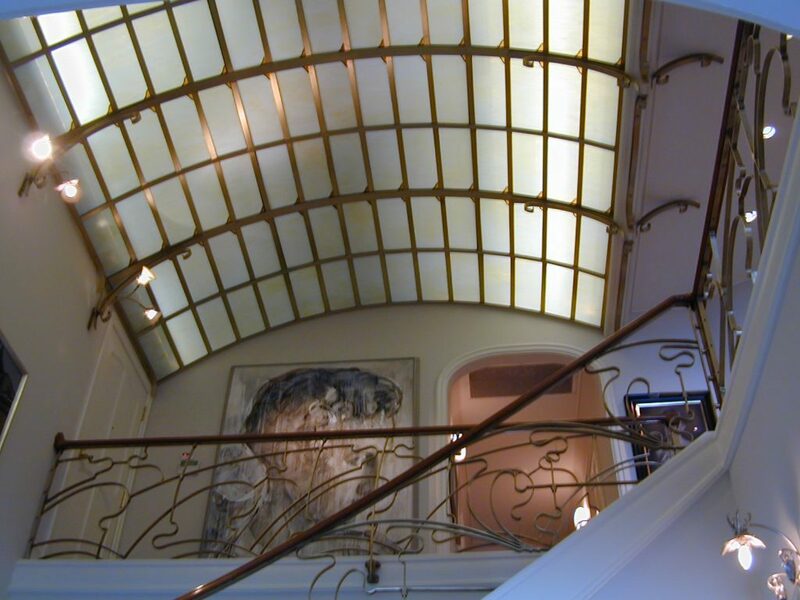 Strong linework and a natural palette of colours make this Box Dome Ceiling a dramatic feature in the stairway of the beautiful residential setting. Each of the fifteen panels are removable independently, allowing for periodic maintenance and relamping. 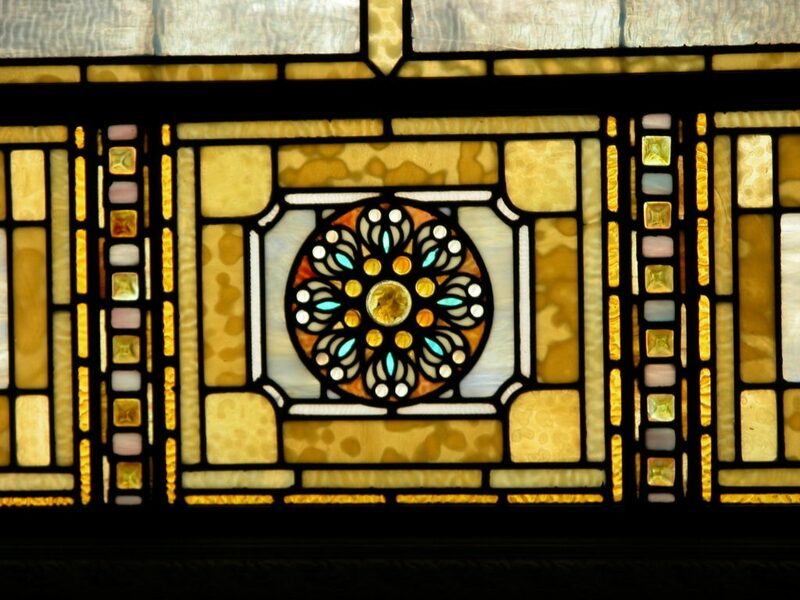 A four panel stained glass compass rose is surrounded by a dozen roses. Clear waterglass and fractured white opalescent glasses make this skylight a brilliant focal point of the residential entry. Wooden mullions with a crown molding frame. 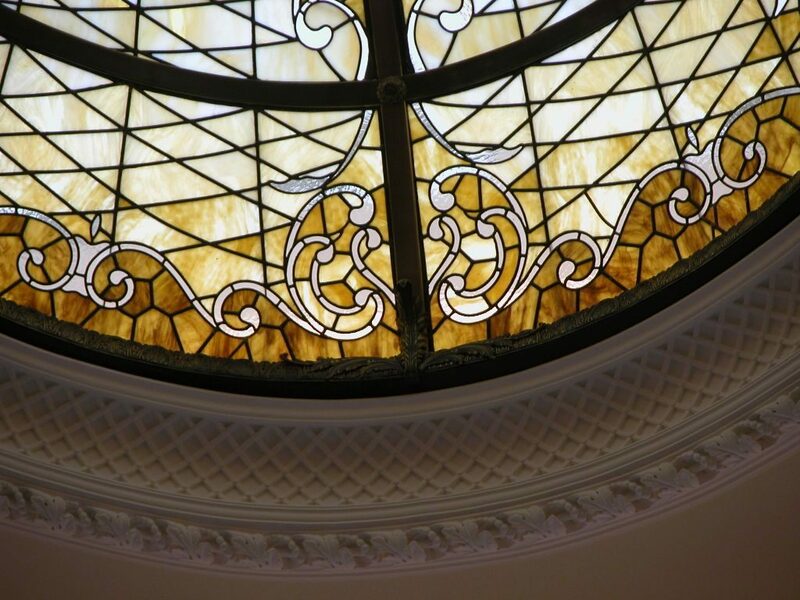 A circular wooden frame supports four curved panels of leaded glass in a laurel wreath design. 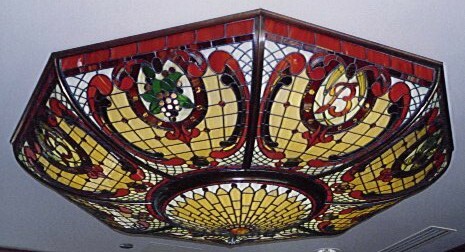 The centerpiece is elevated above the main opening and features an ornamental jeweled design.